Level measurement in tanks and vessels of all types and sizes is a common component of liquid processing operations. For continuous monitoring of liquid level, radar based instruments and transmitters are a newer and faster growing technology. Their ability to perform well under a range of conditions that can prove challenging to other technologies, coupled with their non-contact measuring attribute, make radar level transmitters an advantageous choice for many applications. Radar based instruments operate within specific frequency ranges. The different operating frequencies can have an impact on instrument cost, size, configuration, and application suitability. Greg Tischler, Product Manager - Radar at VEGA Americas, a leader in level measurement instrumentation, authored a white paper detailing the application advantages of the more recently deployed 80 GHz radar level instruments. The bulk of the article is excerpted below, or you can read the entire white paper. This is the alpha benefit of 80 GHz radar; the one that makes the others possible. 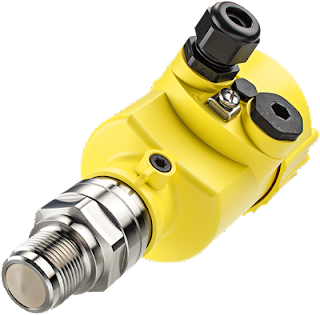 In every process, signal focus is crucial to accurate level measurement, and these new instruments emit the most focused signals on the market. Plant operators have struggled with unfocused radar for decades. The wide beam angle of 26 GHz sensors (and 6 GHz sensors before them) made it difficult for radar signals to miss agitators, heating coils and other vessel internals. The reflections from these installations distorted the echo curve and users were forced to make adjustments to monitor the true liquid level. The new high-transmission models have narrower beams that miss vessel installations—it’s as if they aren’t even there. That is welcome news in chemical and food production, where obtrusive internals are the norm and space is at a premium. Superior focus makes for accurate measurement without adjustment, but it also opens the door for two other major benefits. sensors effective on small tanks. Because their focus is amped up, 80 GHz sensors have small antennas. The new VEGAPULS 64, for example, has the world’s smallest antenna and doesn’t require a large horn to focus its beam at the measured material. The instrument’s small size makes a huge impact, particularly as it applies to retrofitting. Plants can now integrate the most advanced radar devices into their process without shelling out thousands for modifications to their vessels. Smaller instruments, however, aren’t just good for old vessels; they can also help manufacturers stay nimble and market-responsive. There’s a trend in the pharmaceutical and chemical industries toward batch production. Batching allows operators to produce seasonal and low-volume products with less financial investment. Small batches are produced in small vessels, where conventional wisdom says using radar is impossible due to small process connections. Thanks to the compact design of 80 GHz radar sensors, that is no longer true, and operators no longer have to sacrifice accurate measurement in the name of space. Imagine looking at the picture on a standard definition television next to that of an HD TV. The high definition picture would be clearer, sharper, and more detailed due to enhanced resolution. Users will see a similar difference switching from low-frequency to high-frequency radar sensors. When the level of liquid in a vessel gets low enough, 26 GHz radar reads the echo from the material and the echo from the tank bottom as one echo. This tells the user the vessel is empty when it isn’t and presents a natural handicap to process efficiency. 80 GHz devices measure liquid down to the last millimeter, giving users accurate data they can use to optimize their processes. Greater resolution is particularly important for shipbuilders, who count on precise level in large ballast tanks. Thanks to Mr. Tischler of VEGA Americas for authoring the white paper excerpted in this article. Share your level measurement challenges with product application specialists, combining your own process knowledge with their product application expertise to develop effective solutions.